D. strobilaceus subsp. guitterrezii at Manu Learning Center, Madre de Dios, Peru, habitat was a swampy area in full sun. D. strobilaceus subsp. guitterrezii at Manu Learning Center, Madre de Dios, Peru, acute angle of bract apex. D. strobilaceus subsp. guitterrezii at Manu Learning Center, Madre de Dios, Peru, bracteole tubular shape. 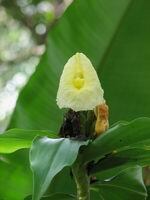 Dimorocostus strobilaceus subsp. gutierrezii is distinguished from subsp. strobilaceus by its bracts which only partially sheath the inflorescence at its base. 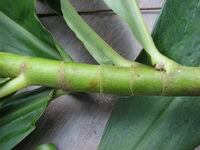 It is further distinguished by the angle at the apex of the bract, more acute at 30-60 degrees than subsp. strobilaceus at 120-160 degrees. Subsp. gutierrezii is mainly found in Amazonian parts of Peru and Bolivia, but Maas reported two collections in Venezuela and Surinam. Habitat is wet forests, edges of forests, open places and in swamps. The type locality was in Bolivia near Puerto Gutierrez on the Rio Yapacani - apparently where the epithet was derived. It was originally described as a separate species, but Dr. Maas lumped it under D. strobilaceus. Recent molecular analysis may result in it being reinstated as a separate species. Compared to subsp. strobilaceus, subsp. 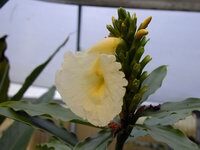 gutierrezii is much less common, rarely found in cultivation. 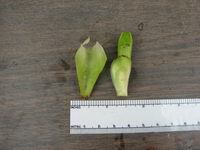 I found it at the Manu Learning Center reserve growing in a wet, almost swampy area in full sun, where it had had virtually colonized the area. 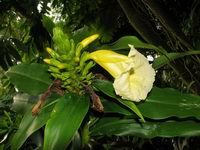 The flowers are more delicate looking, a paler color of yellow and almost orchid-like compared to subsp. strobilaceus. A thumbnail page showing photos of this plant can be found at http://www.gingersrus.com/images/P4325.